Air conditioning resource directory and index. 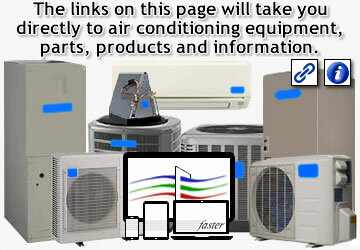 Here you will find online information for air conditioning air filters, controls, equipment and systems, replacement parts, a.c.-related software and computer programs, installation and service supplies, and thermostats. The only place for everything A/C! Air conditioning online reference directory for 2019. Air filters, air handlers and condensers, OEM and compatible parts, software programs, accessories and thermostats. Did you know? You could not cool an area by passing a fan over a block of ice. This process would actually add moisture to the space causing high humidity levels as the cool vapor is naturally heated. Air conditioning works under the principle of dehumidifying the air as it passes through its indoor refrigerant-containing coil (evaporator). This dehumidification process leaves the cool air behind as the heat is absorbed and is expelled through the outdoor unit (condenser). compression ratio:A comparison measurement of the refrigerant's discharge pressure to its suction pressure. The ratio is the discharge pressure (psi) divided by the suction pressure (psi). A high refrigerant discharge pressure and low suction pressure will result in a reduction in efficiency and excessive superheating of the discharge vapor which can internally damage a unit's compressor. impedance:Measured in ohms, it is the total opposition to the flow of alternating current (AC) when voltage is introduced. The ratio of the voltage to current in AC circuits includes resistance (opposition), inductance (magnetic), and capacitance (storage of charge). These are calculated to get the total electrical impedance in relative phases. There is no comparison to impedance and resistance in direct current (DC). thermostatic expansion valve (TXV or TEV):A metering device that controls the amount of refrigerant that enters the evaporator coil. This process causes the refrigerant to go from a liquid to a vapor. A TXV works by an internal spring, valve pin, and a diaphragm that opens and closes through a thermostatic bulb and refrigerant pressures. The bulb and the capillary tube connected to it has a charge that expands or contracts on temperature change. When the charge expands, this exerts pressure on the diaphragm that opens the valve pin allowing more refrigerant to enter the coil. The valve pin is surrounded by a spring that puts pressure on the opposite side of the diaphragm to close the valve pin when the bulb's charge contracts or refrigerant pressures drop. This spring tension is adjustable. Turning the spring's adjustment stem clockwise increases superheat. Counterclockwise decreases superheat. Tech Note: Before adjusting a TXV, take note of the reasons why a TXV opens and closes. This is key in calculating superheat. Superheat is determined by converting the suction (low) pressure and converting it to a temperature. This can be done through a superheat chart which converts pressures to temperatures by the type of refrigerant. This temperature is compared to the actual temperature of the suction line. To get a truly accurate reading in the cooling mode this should be done at the evaporator coil, but most tests are performed at the condenser (outdoor coil). If superheat is too high, the refrigerant levels are low. Low superheat means too much refrigerant is flooding the evaporator. There are many factors why superheat may be high or low. Some examples are moisture in the system, bad or worn compressor, refrigerant leak, refrigerant restriction, dirty coils, clogged filters (air and refrigerant), and poor fan operation. Superheat can also be raised or lowered by raising or reducing refrigerant pressures, so all diagnostic factors should be determined before adjusting the spring on a TXV. condenser:Also referred to as the outdoor or condensing unit, a condenser's compressor converts the low (suction) pressure refrigerant from the evaporator (indoor coil) to a high pressure, high temperature gas. This gas is subcooled as it circulates through the condenser's coil converting it to a liquid (discharge). pleated air filter:Disposable, thick, cotton, polyester-blend material. Pleated Air Filters come in an accordion form that can be extended and placed in its own housing, or constructed in a cardboard frame that can be inserted directly. contactor:In HVAC terms, a contactor is a closed-circuit controlled device to allow high voltage to start the condenser's compressor and fan motor. The flow of voltage through an electromagnet "draws-in" the metal contacts which allows high voltage to flow through them. A contactor can be single-pole, double-pole, or triple-pole. This depends on the electrical phase and type of equipment it is controlling. Always replace a bad or worn contactor with one that is rated for the unit. Tech Note: Do not assume that a contactor that is not engaging is defective. DO NOT manually push in a contactor! Open contacts can often be diagnosed as the electrical circuit to the electromagnet is open. Check for proper resistance and "down-stream" components that would cause the contactor not to close. manual j calculation:Also termed Heat Load or Cooling Load Calculation, this is a formula-based process to determine the heat loss and heat gain of a house in a certain region. These figures determine the size of the HVAC system you are installing. It can also determine if a space needs to be sealed or insulated to improve efficiency. The design temperature for your area is important in factoring loss and gain calculations for walls, ceilings, and floors of different construction materials and applications. Manual J calculations are mostly used on residential buildings. There are other 'Manual' calculations for larger buildings and other design applications. A computer program designed to calculate Manual J will provide details on the information to input and the final figures for determining the proper size of a HVAC system for your home. r-22 refrigerant:Often called "Freon", the 1930 product name the manufacturer DuPont termed their HCFC-22 refrigerant, this hydrochloroflurocarbon is dramatically being phased-out of virgin production by the year 2020. Its biggest decrease came back in 2015 when the EPA allocated that only 22 million pounds could be produced from 51 million pounds the year before. The reason for the phase-out is to introduce non ozone-depleting refrigerants to the industry all-the-while encouraging the current EPA law of reclamation and recycling practices of R-22 for future distribution beyond 2020.
saturation temperature:The temperature at which a fluid changes from a vapor to a liquid or from a liquid to a vapor. By increasing the fluid's pressure, will raise the saturation temperature and decreasing the pressure will decrease the temperature. In HVAC terms, this would be the saturation temperature of the refrigerant in an air conditioning or heat pump system. This temperature is used for calculating 'superheat' which determines the correct refrigerant pressures for a system. Tech Note: The type of refrigerant being used in the system is a major factor in determining superheat calculations. A superheat chart will provide the correct pressure to temperature conversion so it can be compared to the actual temperature of the refrigerant. This will provide an accurate indication if refrigerant levels are too low or too high in a system. short cycling:A HVAC term used for describing a system that turns on and off in a short period of time. This is caused by temperature fluctuations at the thermostat. If this starts happening to your HVAC system and no changes were made to the room the thermostat is located in, there is a problem with the system. A system that is mechanically operating correctly and short cycling of the system occurs; your HVAC system is not conditioning properly. This could be from an undersized or over sized system or the heat loss/gain is too high. Tech Note: The big question is: "When do I know when my system is short cycling?" If you have used the system for a full season and it worked properly and the next season it starts to short cycle, you will know. Even at extreme outdoor temperatures, your HVAC system may run longer, but will not run - shutdown - and start again in 5-10 minutes and continue cycling in this manner. If you are new to the system, the room where the thermostat is located in should not have any vents blocked by furniture. This includes vents located on the walls. Make sure all windows and doors are sealed from outside air. The thermostat should be open to the room and located on an inside wall. Feel around the thermostat for air being drawn from behind it by negative pressures. Examples of negative pressures would be from a wood stove, oil furnace or return air ducting. If your system continues to short cycle, it needs to be determined why this happening. Remember, a system that is over sized for the space it is conditioning can cause short cycling. capacitor:In HVAC systems there are two types of capacitors, run and start. A capacitor is rated in microfarads (µF, uF, MFD) and can be used on a single component (two terminals), or two components (three terminals) at the same time. A dual capacitor (three terminals) has no special advantage over a single capacitor except it has a single common (C) connection for both components. Think of it as two single capacitors in one. A start capacitor assists the component to produce enough energy to gain momentum before releasing its "boost" and allows the rated voltage to resume control. A run capacitor does the same but continues to maintain a voltage supply to the component during its operation. Tech Note: Make sure you replace a defective capacitor with one rated for the system. This should be labeled or inscribed on the capacitor. The three main ratings to match are capacitance (microfarads), voltage (VAC), and hertz (Hz). Capacitors come in different sizes; be certain you have enough space for the new capacitor. Always make sure that the capacitor and its wires are secured and away from moving parts. Capacitor connections should never be exposed to the weather. Caution: A capacitor stores electricity! Never touch the prongs on a capacitor even after you disconnect it from its wiring! Never touch the liquids from a leaking capacitor! Dispose of old capacitors properly. It is illegal to dispose of a capacitor in the garbage or scrap facility. Contact an electronics recycling center to see if they will accept your old capacitors. Did you know? In 1902, Willis Carrier designed the first air conditioning system. This directory contains an index and terms that will guide you to a specific air conditioning topic or item. This web page focuses on air conditioning filtration, units and systems, OEM and compatible replacement parts, computer-related software, controls, installation supplies and a.c. thermostats. When working on an air conditioning system, always remember you are dealing with high pressures and high voltages. Newer, high-efficiency systems are harder to troubleshoot than the older standard systems. Know the principles of electricity and refrigeration before trying to service an air conditioning system.